Lemax Walking Family Figurines (Set of 2) depicts a Victorian family happily walking together in the snow carrying their Christmas parcels. Young boy is holding his Christmas gifts in his arms, whilst his parents follow behind. Wonderful seasonal Lemax Village miniature figurine set which joined the Lemax Village themed range in 2018, suited for placement in a Lemax miniatures display. 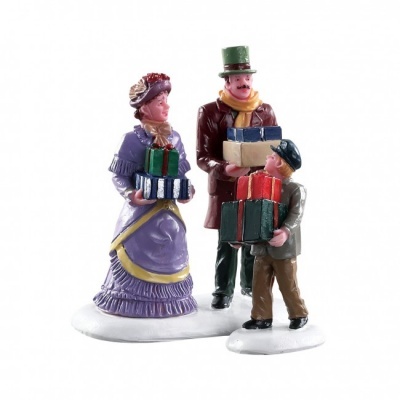 The Walking Family set comprises of multiple individual hand painted polyresin figures on two individual snowed bases to compliment your seasonal Lemax Village display.